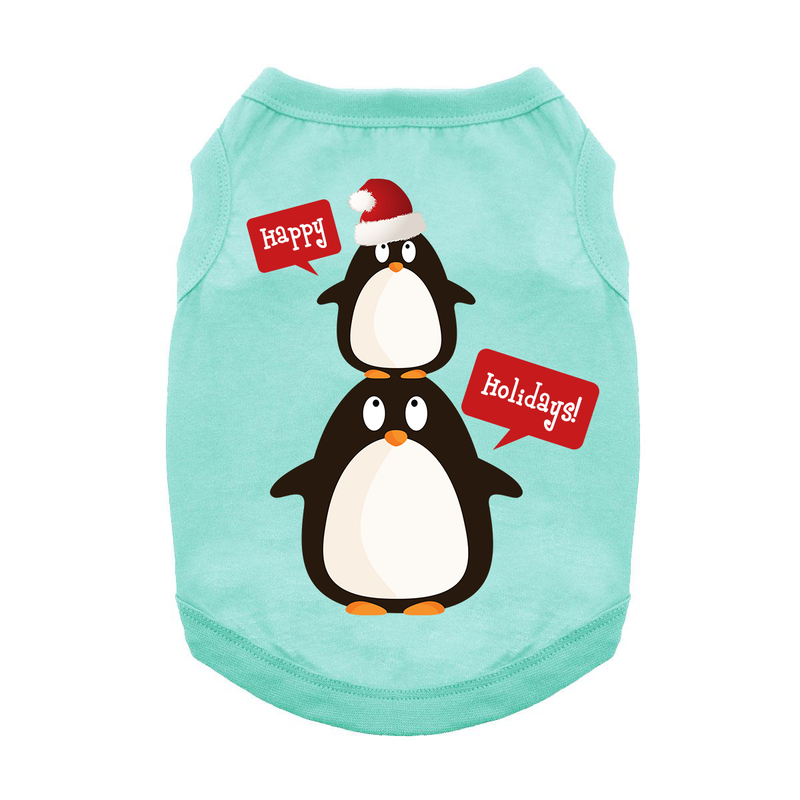 Add some fun to your Holidays with this adorable Happy Holidays Penguin Dog Tank. The Happy Holidays Penguins Dog Shirt will bring out smiles during your outings and this holiday season! This dog tank top features a sleeveless style with a high-cut, stay-dry belly for the ultimate comfort and convenience. This exclusive design is printed right here in our BaxterBoo.com T-shirt Shop for your dog and is available in a wide range of sizes to outfit the whole pack! The 100% cotton is breathable and comfortable. Machine wash cold and dry flat for best results. Great for Christmas gifts and stocking stuffers! Happy Holidays Penguins Dog Tank - Teal Customer Photos - Send us your photo! Posted On 02/06/19 by TAMPA from TAMPA, FL Yes, TAMPA recommends this product! Loved this T for the holidays. Not too much - just enough for the season. Perfect weight for our "warm" Florida winters. Posted On 12/04/18 by Judy F from Roeland Park, KS Yes, Judy F recommends this product! This shirt is adorable, but I should have read the sizing measurements and ordered a different size as this runs smaller than other Mediums. I am going to order a large. I wish they would have noted that this runs smaller than the typical size medium. Posted On 08/15/18 by Susan G from West Lawn, PA Yes, Susan G recommends this product! Posted On 07/28/18 by Paula B from Tampa, FL Yes, Paula B recommends this product! Posted On 01/03/17 by Monica from Roanoke, VA Yes, Monica recommends this product! This is very cute too. The fit is perfect for our West Highland Terrier and he seems very comfortable both inside and outside due to the lightweight material. Much better than a sweater when lying around the house since he tends to get hot. Posted On 01/02/17 by Carol J from Ipswich, MA Yes, Carol J recommends this product! I love this shirt it looks so adorable on my Chihuahua but the only problem I had with it is the neck is a little messed up its like the neck was made to be a turtle neck but they messed up and only put half of a turtle neck on the shirt. Other than that it is perfect!!! Posted On 12/19/16 by Bobbie M from , NC Yes, Bobbie M recommends this product! This one is a little long in the front for all day use by my yorkie but well made and adorable! Posted On 12/12/16 by Sharon W from Metairie, LA Yes, Sharon W recommends this product! This fun holiday shirt just makes me smile! My furbaby looks so cute and festive in it too...nice quality..highly recommend. Posted On 12/12/16 by Jacqueline D from Chesterfield, MO Yes, Jacqueline D recommends this product! great fit great quality only issue was originally I measured wrong so sent back for a smaller size. Unique products, easy shopping experience, great value. Glad I found the site!